Unfortunately, Mitch has other things on his mind. For reasons that currently escape him he’s going to university, making regular trips to the Netherworld and hunting down a demon. The Academy might have prepared him for university but Netherworlds and demons were inexplicably left off the curriculum, not to mention curse breaking. And then the Angels return, and this time they’re hunting his best friend. Instrument of Chaos is the conclusion of the Symphony of the Cursed trilogy, as Mitch, Amelie and Nikola arrive in Dunedin in New Zealand to start their first year at the University of Otago. With her exciting trilogy, Rebecca has firmly established New Zealand as a location for contemporary fantasy, not just Middle Earth! 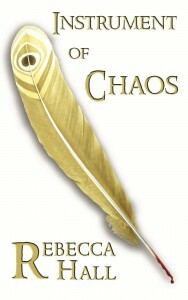 Fans of YA fantasy, readers of all ages, have been captivated by Instrument of Peace and Instrument of War, impressed by Rebecca’s well thought-through magic system, the depth of her characters, and the believable nature of their relationships. The conclusion to the story in Instrument of Chaos may well shock some readers. Elsewhen Press is delighted to be able to help Rebecca bring her vision and talent to such an appreciative audience. The Symphony of the Cursed trilogy is being made available as unabridged audiobooks from Tantor Media Inc. narrated by Matthew Lloyd Davies. The first book in the trilogy is available in audio through major retailers, the rest of the trilogy will release throughout 2017 and early 2018.